Bernardsville, nestled in the northern part of Somerset County, and surrounded by the towns of Mendham, Harding, Peapack-Gladstone, Bedminster, and Basking Ridge (Bernards Township), offers a unique blend of country seclusion, small-town warmth, and easy access to New York City. Known throughout the metropolitan area for its equestrian farms, estates, and historical mansions, Bernardsville is also prized for its excellent school system, its convenient shopping and recreational facilities, and its truly magnificent scenery. The town, which now comprises 12.85 square miles, dates back to the Revolutionary War era, when Washington and his troops wintered in neighboring Jockey Hollow. Bernardsville was originally known as Vealtown, a subsection of Bernards Township. In 1840, Vealtown became Bernardsville, having been named after Sir Francis Bernard, the colonial governor of New Jersey. The railroad line was built through the town in 1872, and changed the sleepy village of small cottages into a premier destination for wealthy New Yorkers. 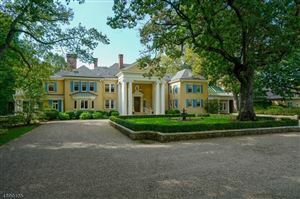 During the 1860s and 70s many bankers, industrialists, and other captains of industry migrated to the Bernardsville Mountain to build lavish mansions and estates. Today, both the historic mansions and cottages coexist happily with modern homes of every architectural style. The current population is roughly 7,800. Bernardsville is south of Morristown, north of Somerville, and about 25 miles west of Newark. It is close to Routes 287 and 78, affording easy car access to New York City, the shore areas, and Philadelphia.